Everyone knows that Aukey’s headphones offer the same great quality as big brand-name headphones, but at a small fraction of the price. Well guess what: that small fraction just got even smaller thanks to a killer sale happening right now on Amazon. 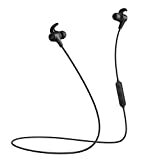 The AUKEY Latitude Wireless In-Ear Headphones are Aukey’s best Bluetooth earbuds by far, and they’re a bargain at $30. But if you use the coupon code JRNS4LAM at checkout, you’ll only pay $17.99.